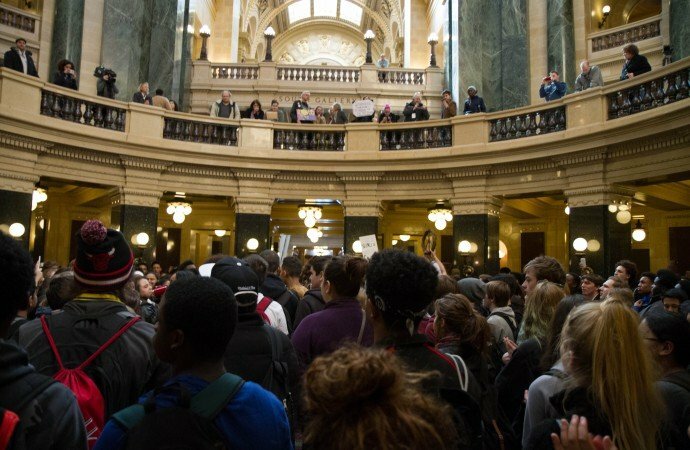 On Feb. 1, six female Wisconsin State Representatives of published a letter highlighting the ways in which Gov. Scott Walker and his administration have left women behind by passing extreme anti-women legislation and leaving women out of his political processes altogether. The representatives cited an increase in health care limitations for women as well as the repeal of Wisconsin’s Equal Pay Enforcement Act, which prohibits pay discrimination based on gender. Vukmir’s column and political stances in general are teeming with contradiction. Within her column, she asserts that Wisconsin women actually are not left out, and are very much included in the political conversation. But throughout her article, she repeatedly targets all liberal women as not deserving to be in the conversation. Her sarcastic attitude toward other women is not only rude and unprofessional, it directly contradicts her original assertion that all women should be included in these proceedings. Vukmir’s political record has shown she is willing to do whatever it takes to maintain a reputation of being fiercely conservative, even if it means contradicting her own. Before Vukmir began her career as a politician, she worked as a pediatric nurse for 25 years. Once she took office however, she supported Walker’s infamous Act 10, which instituted decimating provisions on labor unions. The bill had significant negative impacts on the salaries, working conditions and lives of Vukmir’s own colleagues — nurses. 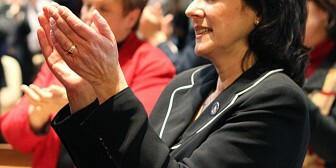 Despite this, Vukmir has always offered her full support for the bill. She has a history of prioritizing the business interests of insurance companies and business lobbying groups such as Wisconsin Manufacturers and Commerce over the health of patients. She opposed the Mental Health Parity bill, which would require insurance companies to cover costs for mental health treatment. She opposed a bill that would require insurance companies to pay for cochlear implants or other hearing devices in hearing-impaired children. Somehow, she found the moral strength to dismiss her multi-decade career as a health professional and support groups and policies that are detrimental to patients. 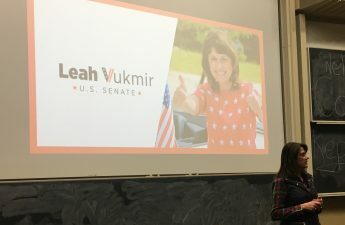 Vukmir’s pattern of constantly contradicting herself indicates she is one of many politicians, not just Republican politicians, who allows her party affiliation to govern her political agenda more so than actual beliefs and values. 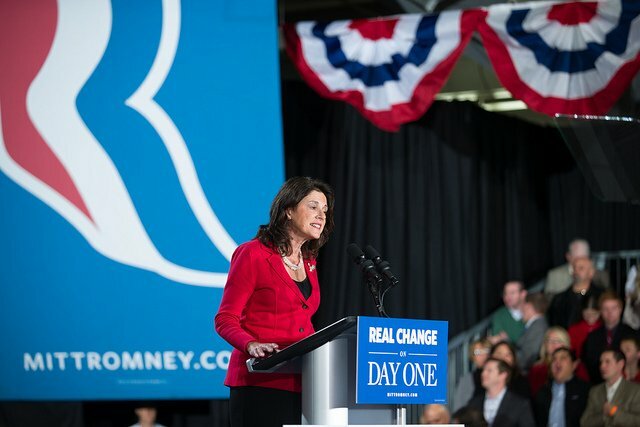 Much of Vukmir’s campaign for U.S. senator has been driven by her publicization of her political career as a proven conservative: “I am the only clear, consistent conservative in the race.” Vukmir has an unwavering devotion to be seen as a Republican politician, regardless of the kinds of legislation that affiliation requires she support. She used to be a nurse, but now that she’s a conservative politician, she has to support Act 10, an anti-nurse piece of legislation. She is a woman arguing that all women need to be included in the political conversation, but because she’s conservative, she has to trash liberal women. This willingness to flip-flop her stance on important issues is, quite frankly, terrifying. How can voters be sure that she will fight for their best interests if she is clearly so willing to give up on her own personal beliefs? How can a state trust that she will stand up for what’s right if her perception of what’s right is dictated by the relative opinions of other politicians? This is potentially the most dangerous aspect of the two-party system. You have to first pick a party, then convince yourself that you agree with all of the party’s policies. It’s okay to change your opinion on a topic, and it’s okay to redirect your course of action in an issue. But too often, we see politicians allow their political affiliation to govern their agenda, instead of the other way around. As voters, it is imperative that we hold politicians accountable for hypocritical and contradictory actions. Do research on your legislators — how committed are they to their professed ideals? Do their histories instill confidence that they will fight for their beliefs? In her column, Vukmir claims that “liberals want us brainwashed.” I would implore Vukmir and other politicians to investigate how they may be allowing their own parties to brainwash themselves, and consider how they may insure that their values are their own — not just the values of those who fund them.